The Trojan Horse I was hit with is called Trojan:Win32/Reveton.A. It is a scary virus that locks up your computer and displays the very disturbing picture on your screen above. It looks like it has been sent by the Metropolitan Police and accuses you of looking at illegal material on the Internet. It goes on to say that in order to unlock your computer you must pay a fine of up to £100, and gives you some options for paying this fine online. Well I was mortified, shocked and scared. I thought they must be mistaken I have never been to any of the sorts of sites they are accusing me of. After I calmed down I loaded my husbands computer and carried out some research. To my relief, then anger, I found out I was victim to a Ransomware Trojan Horse or Browser Hijacker. 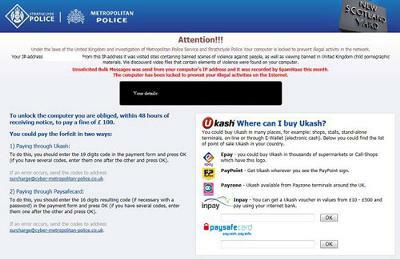 It is fake and if you pay the ransom you are giving your hard earned money to online fraudsters! 7. He ran the GridinSoft Trojan Killer install file from the USB Pen. 10. when my computer restarted it worked perfectly, to my relief! I was so paranoid of getting this virus again I bought a license for GridinSoft Trojan Killer and ran it again after the updates were applied. It found more files for this Trojan which thankfully were also removed. I checked my computer and didn't find any of my files missing. Virus writers do not have a moral bone in their body. To me it looks like pure greed motivates them. They may as well rob you in the street! The law needs to be more strictly applied to stop this form of fraud. I dread to think how much money they have made from this. It is sickening!! Thanks to Martin for his article "Reveton Trojan Infection"! We are glad that our product saved your computer :) GridinSoft Trojan Killer can help you with another kind of malware too. Thank you Martin for writing your own web page which must have been a frightening experience. I am pleased to hear you found out that this Trojan is a fake produced by cyber criminals. There is no legitimate authority behind the message that appears on your screen. This particular strain of virus is expanding into areas such as claiming your illegal activity includes downloading music illegally. In addition, those who have been duped into paying the fine do not have their computers unlocked!. Without the excellent step by step instructions you provided Martin, lots of victims would be $$$ out of pocket and would have to take their machines to a Small Computer Business Repair company for fixing. 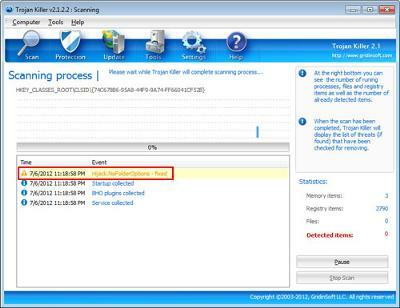 Gridinsoft Trojan Killer is a good solid product to help remove Ransomware. In the 'General Malware Removal Principles' section of the programs Help file, it says the first thing you must not do is Panic! It warns about making quick decisions in haste which can leave you out of pocket and it a worse situation than before. I am pleased to read you managed to compose yourself and tackle the problem with a rational mind! Trojan Killer also comes with additional tools that compliment the Malware removal process. Quite often Malware will change your computer settings. When you remove the offending program, the settings that were changed often remain in the changed state. Join in and write your own page! It's easy to do. How? Simply click here to return to Computer Virus Removal.